Home | Articles | Fertilising lawns in winter! Fertilising lawns in winter! – Is it more important than spring and summer fertilising? Most Australians have been fertilising at the wrong times of the year. Australia’s relatively warm winter climate and our change in turf types has been highlighted in research as a reason why we should be fertilising in winter and less in spring and summer. This research conducted by Ozbreed has shown that it is possible to keep Buffalo, Kikuyu and Zoysia turf green all year round when following optimum fertiliser applications and certain mowing practices, even in frost prone areas. This research has designed recipes to keep these turf types green all year round in many parts of Australia, using specialised fertiliser formulations. Most Australian studies of winter fertilising warm season turf have been conducted on Couch turf, which in this study showed poor results. Most USA and other overseas research on winter fertilising has been conducted in regions that reach minus 10° Celsius or colder in winter, yet have warm temperatures for the rest of the year: regions such as Florida, Texas, and Georgia in the USA. In these regions winter fertilising can cause winter kill. In Australia, only climatic regions similar to Canberra and Armidale get that cold and have the potential for winter kill if fertilised in winter. For the rest like Melbourne, Sydney (Including frost affected Western Sydney where the research was conducted), Perth, Adelaide and Brisbane, this research unlocks the true potential of keeping lawns green in winter. The results were unexpected. Common practice is to not fertilise in winter, as it is seen as a waste of time, or is often considered to hurt a lawn. This research for regions that do not usually get colder than minus 3° Celsius clearly shows that winter fertiliser greatly improves the green colour of many turf types. Over 30 frosts were recorded with a lowest temperature of around minus 3°c. In general, Kikuyu, most Buffalo and Zoysia types benefited from autumn and winter fertilising. Couch however showed no real benefit from winter fertilising in this trial. As Couch is probably the most researched sports turf, it is little wonder that conventional research and practice say to not fertilise lawns in winter. If well fertilised in winter, the lawns needed no fertiliser in spring to quickly green. Those that did not have winter fertiliser and no spring fertiliser struggled to green up. Next autumn and winter try fertilising your client’s lawn at a heavy rate. Based on this research different recipes have been formulated to keep Buffalo, kikuyu, and Zoysia green all year round for many Australian regions. If you have Couch, these recipes will generally not work. All the Buffalo types showed good winter colour improvement by fertilising in autumn and winter. In our trials, Palmetto® Buffalo had better results than other Buffalo types, except for Sapphire® turf which rated the best. Sapphire® Buffalo with its fine leaf seems to be less effected by the frost and had the best winter colour ratings. Palmetto® turf had better ratings when fertilised in autumn and not in winter than most other types. This trial was on 3 year old plots. Younger turf often shows different results due to low thatch build up. The only ones that thatched less were Palmetto®, Sapphire® and Sir Walter Buffalo, all having better winter colour than the 3 other types, which all thatched considerably. However, even the more thatchy types improved with winter fertilising, just not by much. Fertilise at the beginning of April and again in mid-June with slow release fertiliser applications at a heavy rate, or better still use a blend of quick and slow release as per the ‘Autumn Winter Blend’ as used in the trials these recipes were based on. Fertilise in mid to late October or early November with a moderate rate of slow release fertiliser, or a heavy rate of organic type fertiliser. Fertilise in January, February or March if the lawn is having problems such as lawn grub or disease, has brown patches, or is looking a little tired, with a moderate application of slow release fertiliser. However, it may be worth considering further optional applications if your lawn receives very heavy wear from dogs or kids, or you want a dark green lawn all year. THE MOST IMPORTANT FERTILISER TIMES ARE AUTUMN AND WINTER. Mowing practice can also help keep Buffalo greener in winter. Leave at a moderate length for most of the year. If after all the recommended fertilising the lawn browns off in winter, lightly mow the Buffalo. Under even many moderate frosts and the odd heavy frost, only the tips of leaves will burn. A light mow removes most of the burn making the lawn instantly greener. In spring every year for thatchy Buffalo types, and every 2 to 3 years for Palmetto® turf, Sapphire® turf and Sir Walter, dethatch with a specialised machine, or simply remove the thatch by mowing very short (scalping) and collecting the clippings. This will greatly improve the next year’s winter colour. Without winter fertiliser, Kikuyu generally has the best winter colour. The difference in colour between one brand (namely Kenda® turf) with and without winter fertiliser was less pronounced, but it is known for its excellent winter colour. It still grew more with a winter fertiliser, and in high wear areas this extra growth would be of great benefit. Other Kikuyu types benefited a lot from the heavy fertiliser application rate in winter. This really depends on what it is used for. High use sporting facilities that receive regular wear e.g. council ovals or backyards with dogs should be treated in a similar fashion. Fertilise so that the turf never runs out of nutrient. If you use slow release, that will mean every 2 to 3 months. If you use regular fertiliser, it will be more often. In winter it is best to use a blend of quick and slow release like the autumn winter blend used in the research. It is very important to fertilise in mid-April and mid to the end of June using high rates. Home lawns and amenity areas that receive moderate wear or less. Fertilise using the same recipe for Buffalo. Also similar to Buffalo, mowing lightly in winter can remove frost burn. Dethatching or short mowing every 2 to 3 years in spring will result in a greener lawn in winter. In the trial Nara™ Native Turf and Empire™ Zoysia showed differences and needed slightly different fertilising and mowing recipes. Of all turf types including Kikuyu and Buffalo, Nara™ Zoysia showed the greatest amount of improvement. Unfertilised in winter, Nara™ Native Turf had ratings of 3 and 4 out of 10 for winter colour, whilst when fertilised heavily in winter and autumn it had an average rating of approximately 7.5 out of 10. Nara™ Native Turf beat almost all of the Buffalo types for winter colour when fertilised heavily in winter, but was worse than almost all the Buffalo types when unfertilised. Winter fertilised Empire™ Zoysia rated a good 6.5 when mown short for winter colour, which was around the same as most Buffalo types, and unfertilised had a poor rating of around 3. 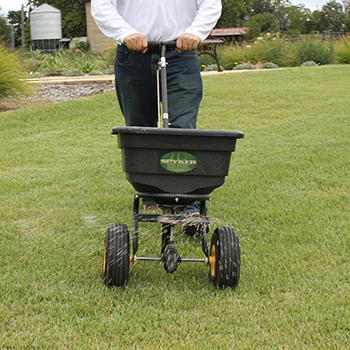 Winter fertilising is crucial for a green Zoysia in the cooler months. The fertiliser recipe is the same as Buffalo for Nara™ Native Turf, while with Empire™ Zoysia you can dispense with the mid spring fertilising in late October, early November, unless the lawn has high wear. Nara™ Zoysia grows quicker than Empire™ Zoysia, so it needs more nutrients, but that also means that Nara™ Native Turf recovers from wear better. With Empire™ Zoysia it is recommended to keep it mown short coming into autumn and winter for better winter colour, unless you have shade. Nara™ Zoysia should be left a little longer, but mow it short once at the end of winter for a quicker spring green up. Like Buffalo, if Nara™ Native Turf discolours in winter, mow the tips of the leaves. Fertilise in autumn, spring and summer as per traditional advice. Winter fertiliser made no difference to winter colour in these trials. Northern parts of Australia will benefit from a winter fertiliser. About the fertiliser used in this trial. 2 Spec Elevate from Globe was chosen for a good reason. It is mainly made up of slow release fertiliser, which has the benefit of continuously providing nutrients over a long period in the cooler months, but it also has a percentage of quick release that is available to green up a lawn rapidly. It has a good rate of Iron, which is essential for winter colour. Its high rate of Potassium helps turf grass withstand stresses, such as cold temperatures, drought, traffic and shade. Potassium also aids in producing a deep root system that makes the grass stronger. The Calcium in the fertiliser also ensures adequate root and shoot growth. Its nitrogen is available in a good blend of both slow and quick release. Used at a high rate, this study showed 2 Spec Elevate greatly improves the winter colour of Buffalo, Kikuyu and Zoysia.